As a rising star within the TVB realm of entertainment, especially after starring in last year’s hit drama Life on the Line <跳躍生命線>, Arnold Kwok (郭子豪) was once named to be one of the biggest rising stars to watch for 2019. Though serious about his acting career, his DUI arrest last month has significantly impacted the 27-year-old’s career, especially after the actor had denied it once before. Though his career and public image may be in danger, the actor does have alternate plans to fall back on. He hails from a wealthy family, and it’s been discovered that he also has a non-celebrity girlfriend known as Karen, who works in the art industry. 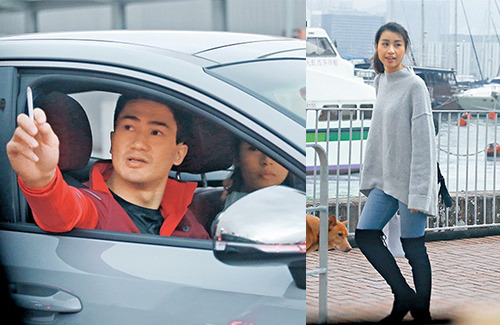 Arnold was recently spotted in Tai Koo Shing, driving the same vehicle that he was in when he was caught with DUI, with his girlfriend by his side. He was smoking as he happily chatted with his girlfriend. After dropping her off in Causeway Bay, he drove off to TVB Studios in Tseung Kwan O to resume work. I predict his career is over. Shame since he has the look and possibly potential to make it. @jjwong Amd voice and not so whimsy looking. He smokes too?? That’s horrible. Ahhh just a fu er dai behaving like he owns the world. The crocodile tears were shed only cos he got caught DUI. He is crap, can only act as the hunky guy who has more brawn than brains.